Nihola eschews the turning-box method, instead using a front steering linkage system, just like a car. The steering comprises tie rods and individual wheel pivots, and uses a design known as Ackermann steering geometry. Along with being extremely cool and fun to draw on a napkin, this steering mechanism is smooth and responsive. It also theoretically will wear less on the tires, since they are each turning exactly along the outside of their own individual arcs. I hope you’re geeking out on this as much as I am. There is another advantage to a steering mechanism independent of the box, and that is that since the box is not changing position, the cabling can run more cleanly and predictably. On the Christiania, the brake cables for front and rear, as well as the shifter cable, all come from the handlebars, which are attached to the box. Thus, the cables need to be routed in such a way that they are long enough to clear the box when it’s being turned, but not so long or dangly that they get caught on the operator’s feet while pedaling. On the Nihola, the cables stay clamped to the frame tubes, as on any normal single bike. This is much tidier, and would be a great advantage to home or shop mechanics servicing the bikes, and presumably would reduce cable and housing wear. Anyway, about that test ride. I was one of the many people at Clever Cycles’ winter party in January. I’d wanted to test a Nihola for a while, so I asked to take one for a spin and Todd quickly rolled one out onto the street for me. I took the trike for a spin round the usual Clever Cycles test route: down 9th a couple blocks, over to 10th, up to Clay and back. Shifting, pedaling, and braking were all blissfully smooth and clean. I kept reminding myself that this was a brand-spanking-new bike in very good adjustment, but even so, it is clearly very well designed so that the mechanic aspects all work well. All three of the brakes are drum brakes, and the gearing is an internal 8-speed hub with a grip shifter. In another departure from traditional trike design, the Nihola uses a regular city-style handlebar instead of the “shopping-cart” crossbar found on most cargo trikes (including the Christiania, although our Christiania has been modified to use a normal handlebar). When I returned from that first spin, Todd told me I should try it with a load and gamely donated himself as the cargo. We did another circuit, with him pointing out various aspects. He asserted, correctly, that because the steering is independent of the weight in the box, the handling (i.e. how easy it is to steer) does not change as the weight of the load in the box changes. That’s pretty neat, as we say in the bike industry. The trike rode great with an adult-sized load. 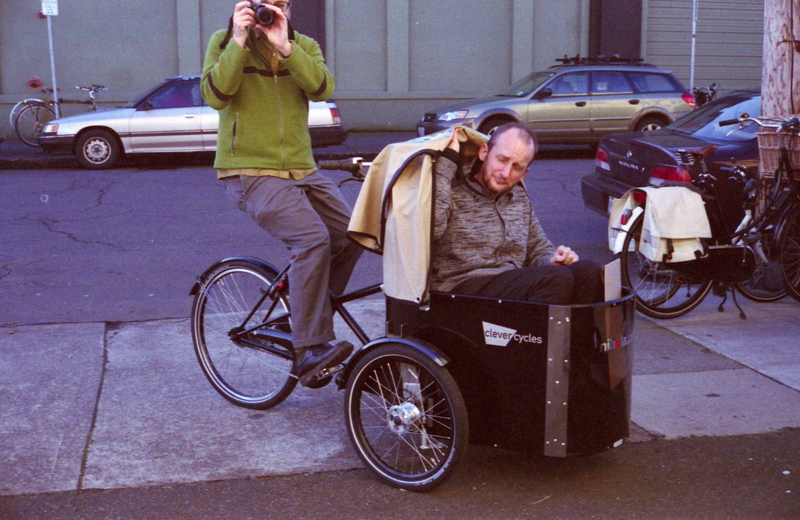 That’s me at the pedals, and Clever Cycles owner Todd Fahrner showing me how the trike handles under load. Thanks Shetha for the photo. We came back from that round, and no sooner had Todd exited the trike than a young fellow, just off his dad’s Xtracycle, asked if he could go for a ride. I said sure, and took him around the block, too. Again, it exhibited smooth and intuitive handling with the load in question. My conclusion at the end of this test ride was that the Nihola is an extremely well-designed cargo bike. The biggest downside it has, especially compared to the Christiania, is the relatively small cargo box. In the weeks since I tried the Nihola, I always note how full our (very large) Christiania cargo box gets when we go to the supermarket, or to a friend’s house. In many cases, we can barely fit Anastasia in there amidst the provisions (especially now that she’s a bit fussy about legroom . . . ). Now, we’re pretty heavy travellers, which is why a cargo bike appeals to us to begin with, but it would be a serious problem if I couldn’t go get a full load of groceries, case of wine, bundle of TP, etc, with Anastasia in the seat. So for our purposes, a Christiania is the superior choice. Also, the handling differences between the Christiania and the Nihola are, in our case, somewhat mitigated by the alterations we’ve done to our Christiania trike. A disadvantage that both trikes have is that they do not come equipped with a generator light system, and there’s no simple way to install a hub generator (theoretically you’d want to install one hub generator on each of the front wheels, which would be wonderful but expensive). We have a sidewall generator on our Christiania, and the same would work on the Nihola, but it’s far from ideal. If you are looking for a solid, durable cargo trike, either the Christiania or the Nihola will serve you very well. The Nihola features extremely high performance, but lacks the cargo space of the Christiania. The Nihola would be great for taking a kid or two to and from school; or, from the commercial standpoint, for using as a delivery vehicle for small packages or repeat trips (such as pizza or other food delivery). From my family’s perspective, the Christiania is the ideal choice, but the fact that there is a choice is a blessing in itself. No matter what, if you have serious interest in these machines, you owe it to yourself to give them a test ride. Click here for product information on the manufacturer’s website; Clever Cycles also has a very informative page about the trike on their web site. Where to buy: Clever Cycles. Are they available anywhere else in North America? Please let me know. The magic of the “more” tag. Someday I’ll migrate to a real design, i swear! Thanks for the review – Nihola does make a smart bike. I was looking at those a week or two ago, also thinking the cargo capacity wasn’t quite enough (for farm deliveries). The long john style bikes are tempting but they might have the same trouble. I’m curious why you didn’t go with one of those, and if you ever feel like getting three wheel lines to avoid potholes is significantly more tricky than dealing with just one. Is that something you just get used to? Will, I definitely thought of you while writing this. 🙂 Glad you liked it. I’m looking forward to some time with that Pilen. Josh, you can carry a crazy amount of stuff on a cargo bike, though I think you are right, the Nihola is not the right bike for farm/CSA deliveries. You should talk to Joel at Magpie. The trick with the long-john bikes is to use the platform to support a wider load. I’ve seen Joel load up his cargo bike with 12 moving boxes by strapping them together into one unit, and stacking them. Anyway, there are ways, but something like a Nihola (or even a Christiania) would be too limiting for those kinds of loads due to the box. Check out the CETMA cargo bike, made in Eugene! I need to try one of those out myself. They’ve got them down at Clever Cycles. Another option for you to consider is a Bikes at Work trailer, which is designed to carry 18-gal Rubbermaid tubs, works with any solidly built bike, and costs less than 20% of what a cargo bike will run you. To get really serious, get a cargo bike and pull a BAW trailer with it. See here for an article I wrote about our BAW trailer. I’ve never consciously noticed the pot-hole issue, but thinking about it, what I generally do is avoid them with the front wheels (because hitting an obstruction with one of the front wheels would affect the handling/steering, and also it’d affect Anabee more) and hit it with the rear wheel, and usually I unweight the saddle when it hits. The tyres on these bikes are 2″ wide and ridiculously heavy, so they absorb quite a bit of shock. I also use a sprung saddle, which helps, too. So, yes, you just get used to it. Thanks for the detailed review! My wife and I are going to be in the market for a cargo trike in the near future, and details like you’ve provided here are excellent. This is awesome! I’m collecting all the links I can to cycling with kids and I’ve bookmarked this post for future reference as well. Cannot wait to have our little one (in the cutest cyclig cap ever!) enjoy bike rides with us. great review, i’ll have to add it to http://www.carsvscargo.blogspot.com reviews I’m testing out the Babboe tomorrow as christianias are not yet here in Toronto. unfortunately the Nihola cigar is too small for 4 kids and the Velorbis mobii Trike is a little out of my budget. I’d like to try one too – they look great fun. My local cargobike shop keeps threatening to stock them, but it’s not happened yet. Like you, they’d be too small for us. 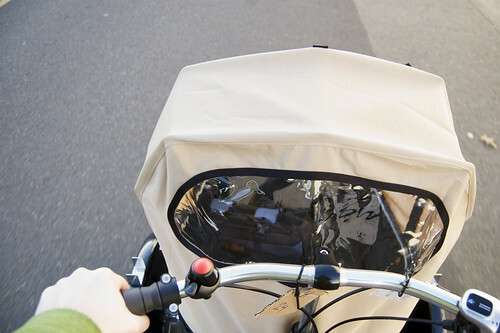 I should add, the bakfiets.nl trike has the benefit of normal handlebars and dynohub lighting, but I suspect that Clever don’t import them, so it’s propabably a moot point. I really enjoyed your rumination on the various trikes and cargo bikes incl the b.nl trike. where is the dynohub on that trike? on the front wheels? i’d love to check one out sometime, they look nice and roomy. Yeah, very roomy. The dynohub is on the left hand front wheel. interesting… do you notice the dyno wheel pulling a bit in the steering, or is it a small enough amount of drag that it makes no difference? I would love to get dynohubs on the trike, and if i thought I could just do one wheel I would. I’ve assumed that doing both front wheels would be the only way to go. The drag is too small to be noticeable – I can ride no handed and it doesn’t pull at all. Not sure if that’s because other forces are just more obvious (ie loading in the box / road camber, etc), and therefore it should be fine on any trike, or if it’s because the bakfiets.nl has a stiffer damper than other trikes I’ve tried. However, my hunch is the former. The frame and steering of the Nihola are not only of use on pavement. Its no mere shopping cart in the dirt. At some point the gearing becomes insufficient, then the rear tire starts slipping. The pedals come a little close to the ground, the nose can drag. Mud is not a strong point with the standard-issue smooth rear tire. Steep uphill side slopes can be a problem. I’m definitely in favor of Nihola over Christania or a two-wheeled alternative. Ray, if you’re still on the post, I would love to hear more about how the Nihola does on logging and horse trails, as this is much of what I will be riding to get home with groceries. How does it handle on uneven ground, and how hard is it to pedal? Thank you! Well, how it does depends a lot on exactly what your trail is like. If a horse trail is in soft turned-up ground that could get ugly, I’ve found horse-foot holes that the 20″ tires fit into rather nicely, you have to get out and lift the front (easiest empty). Side slopes can be challenging if you are not able to lean far enough to compensate. Climbing while on a side slope is the worst, because your body is quite close to the edge of the “balance triangle” that you need to keep your weight inside of. You can of course go quite slowly, perhaps not even doing full rotations of your pedals if the balance does not allow it. On the positive side, a load in the box makes side slopes a bit easier, if you have the gearing and traction needed. Hill climbing head-on is great. You can go as slow as your gears allow, without starting to wobble (yay!). You can also stop to rest whenever you like, without getting off. On firm ground a Nihola does not feel very heavy, I’ve often carried 100lbs or so and its not bad at all, on firm ground. About the gears. For the dirt, consider getting the biggest sprocket you can get your hands on, I assume you’re in the States, so probably the standard hub is the Nexus 8. A 23t & 38t combo gives you gearing down to maybe 23 gear-inches and that is not too slow. (Especially if you are not a strong rider.) Regarding the top end, it would go to 70 gear-inches, which is also not too slow. A Nihola just doesn’t handle speed like a bike; the steering responds mercilessly regardless of how you lean. A trike in general is quite different from a bike on uneven surfaces. It abruptly and forcefully follows the contours you drive on, so be ready to get off of the seat an inch or two at the right moment, for your own comfort. You need to learn to let the trike move without excessive movement of your own body. Hopefully you can test drive a Nihola toughly, try driving up and down curbs and that sort of thing. Its strange at first, coming from a bike.